This time of year provides a bounty of nourishing and tasty spring herbs. Here is one way that I like to cook them – a simple, no-fuss risotto. Today I harvested two large feathery Fennel leaves and three verdant tops of Stinging nettle (from Frankendael herb orchards). Yesterday I plucked three huge Dandelion leaves from the school garden (where I work). The dandelion leaves were wilting away in my fridge today but still taste great cooked, so those three herbs were chopped and added to the pot this evening. I could have many other herbs of course (Dead nettle, Wild garlic seedheads, Geranium and Ground ivy for instance) and I could have harvested heaps of Nettle and Dandelion leaves but there are other days, other meals, other foragers and other creatures who need those plants. 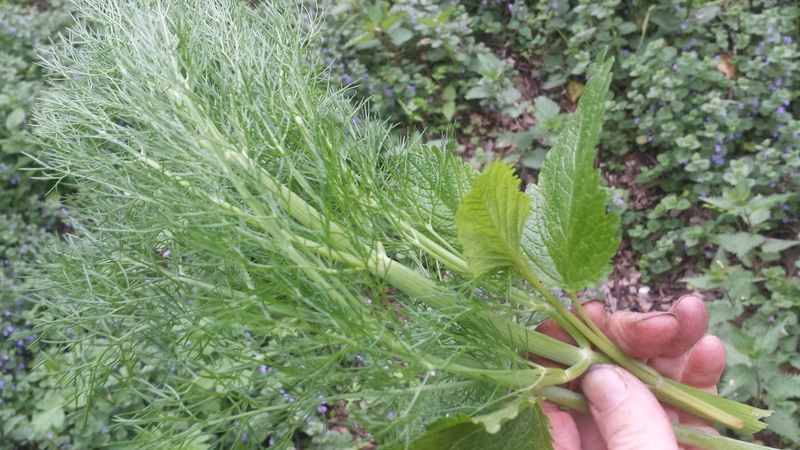 Upmost in my urban foraging mind is that by using foraged material as I would use herbs (i.e. in small amounts for culinary seasoning), I reduce my environmental impact and reduce the risk of eating contaminants and plant poisons (should they happen to be on or in the foraged plants). This is why I call my work Urban Herbology, rather than urban foraging. To find out more, do come along on one of my herb walks soon! 1 cup finely chopped seasonal fresh herbs (e.g. Fennel leaf, Dandelion, Stinging nettle). Salt/Nori flakes/pepper/Parmesan cheese to taste. 1. Add the rice, stock and hot water to a heavy based pan. 2. Stir briefly to prevent it sticking to base of pan and bring to a boil. 3. Add chopped herbs and onion, stir and bring to boil again before reducing heat to simmer gently with lid on. 4. Simmer as per instructions for your specific rice, the dish thickens up considerably and may require lots more water, it depends on the type of rice used. My risotto rice took about 25 minutes to cook through completely and become nicely loose and creamy. 5. Whilst simmering, continue to stir briefly whenever you think about it. You may need to add a little more water to prevent stickiness. 6. 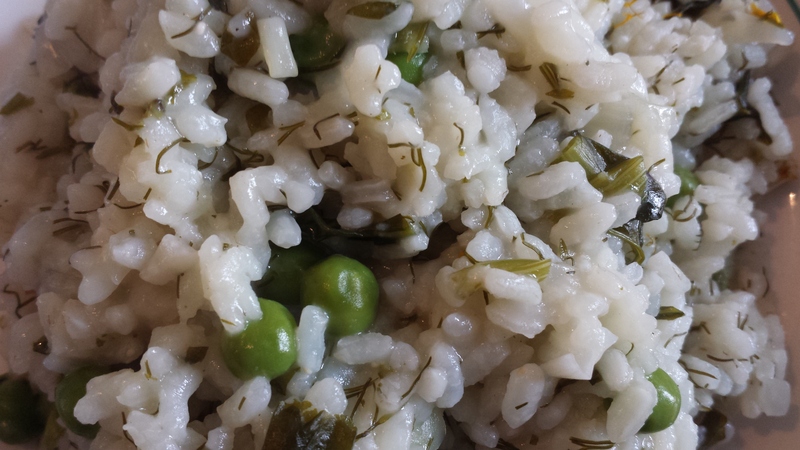 When the rice is cooked through and of a good consistency, add the frozen peas to the pan. Simmer for a further 5 minutes. 8. Serve with a hearty grating of Parmesan cheese if desired.